July 10, 2018 - Ambroise Fayolle, Vice President of the European Investment Bank (EIB), welcomed Jan Wörner, Director General of ESA, to sign a Joint Statement on behalf of the two organisations. 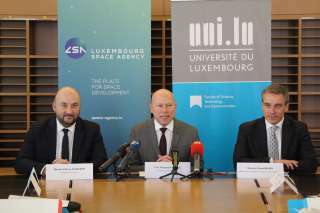 The Joint Statement puts forth the intention of the two organisations to cooperate on supporting increased investment in the European space sector, thus helping create a level playing field for European companies to grow and become globally competitive. It also supports setting the foundations for Europe’s engagement in Space 4.0 and new space. At the same time, they recognised that, more than ever before, the sector is no longer only the preserve of institutional players thanks to decades of institutional investments in space. Indeed, they stressed, there is an increasing interest in and growing importance of commercialisation at every level of the space value-added chain: from space manufacturing, to transportation, to satellite operations and the development of consumer services based on satellite signals and data. By bringing together their complementary expertise and experience, EIB and ESA formalise their shared goal of and intention to promote a seamless chain of investments in space for Europe by developing various axes of cooperation, such as raising awareness among investors of the potential of space as a driver for innovation and growth and supporting actors in the space sector that have promising short- or medium-term growth perspectives. Their common objective is also to improve the access to finance for promoters of space projects, including via the study of suitable joint instruments. From 2000, the EIB supported significant projects in the space and aerospace sector for total amount of EUR 5,4 bn. As examples, the EIB supported Alphasat (EUR 225 m), Soyuz in Guyane (EUR 120m) and many RDI programmes and systems in Europe.